Shri V.P.Nandakumar MD & CEO, Manappuram Finance Ltd.
Making the world a better place is something we can all do. “I don’t want to make money. I want to make a difference”- world-famous American singer Lady Gaga said lately. The story of Sakkeer Hussain Cholayil, MD Rahna homes is an interesting one. A cushy job and a globe-trotting life did not deter him from chasing his private dream, which was nothing but to give something back to his hometown, Thrissur. After making enough money as a petroleum engineer in South Africa, he ventured into real estate to provide responsible living spaces for Thrissurians. 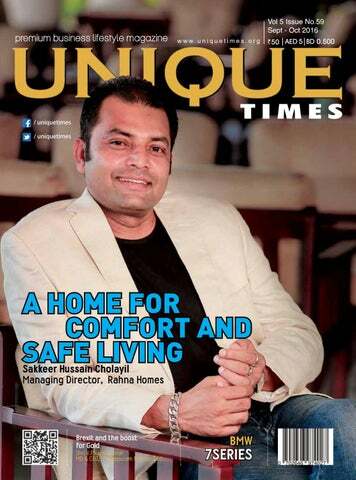 What sets his venture, Rahna Homes, apart from most of the other avaricious real estate firms was a simple thought: “If we failed to cater a perfect home to our customers, then that entire concept is gone”. He kept his promise. And now his Rahna Homes, interestingly that is his wife’s name also, has already garnered the trust of hundreds of Thrissurians, both NRI as well as local. “Even after Brexit the gold is the one asset class about which there is no uncertainty”, writes Shri. V.P. Nandakumar, the Chiarman and Managing Director of Manappuram Finance in his regular column. Who says BMW is the third option after Audi and S Class? Read our special report on BMW 7 series. Don’t forget to visit Lithuania, a Baltic beauty with mesmerizing castles and astounding forests. Actually, as you know we are not limited to these articles. Writings on Auto, stock market, gadgets, banking, movie review, book review and several other articles are waiting for your response. As always, thanks for picking us up and we hope you enjoy the read! he Information Technology conglomerate, Infosys, is likely to cut nearly three-thousand jobs in coming months. It is said that the company was forced to take such an extreme step after it had lost an international project. The company was invited by the Royal Bank of Scotland to assist their new project. But, unfortunately, the bank gave up the plan to create a separate bank. Anyway, it badly affected the shares of the company. It declined nearly one per cent to settle at Rs.1,051.80 on NSE. Meanwhile, on BSE, it dropped over one per cent to reach Rs 1,050.95. However, a source claims that the company would not dismiss any employees. It added that the employees would be reallocated to other projects. he app-based transportation conglomerate, Ola, has ceased the transportation app, TaxiForSure after acquiring it. Last year, the company purchased their biggest rival for around two-hundred million dollars. It is said that nearly seven-hundred people would loss the job. Earlier, this year, the company had launched its low-cost cab, ‘Micro’. It is learned that the transportation company is trying to expand its service across the country. Uber is the prime rival of the conglomerate. With this unexpected move, their tough battle is likely to intensify in coming months. Reports say that Uber sold off their Chinese operation and is trying to create a dominant space in the Indian market. inancial ministry, headed by Arun Jaitly, has advised the government departments to create accounts in the Reserve Bank of India for all transactions above hundred crore. It decided to use ‘Electronic Focal Point Branch’ accounts to receive non-tax revenues. The same will also be used to make fund transfer for plan schemes. As per information, all government departments were reportedly asked to create e-FPB account with the RBI. As per report, over three lakh crore rupee is estimated be collected in this financial year as non-tax revenue, including dividends, grands, and interest. With this move, the government aims to seal fund leakage. he Supreme Court of India has directed the real estate conglomerate, Unitech, to refund around fifteen crore rupees to the Gurgaon home’s investors. The court instructed the real estate giant to pay at least five crore rupees within two weeks. The company has been given a relaxation period of four month for the balance payment. Earlier, the consumer forum had given a similar judgement responding to a complaint filed by more than two dozen customers. The company appealed against the consumer forum’s order in the Supreme Court. However, the new order given by the top court gives strong warning to the realestate companies. he retail conglomerate, Walmart, is likely to invest in the India’s food processing sector. The government reportedly believes that the foreign participation would add to the growth of our country. In order to invite more foreign participate in different sectors, the country had recently liberalised Foreign Direct Investment rules. Lately, a Brazilian poultry company had shown interest in investing in the Kishore Birayani. Reports say that they aim to utilise the Future Group’s outlets to strengthen their footprints in the country. The Brazilian company is one of the largest poultry exporters of the world. However, the Future Group not yet acknowledged the news. he Chinese e-commerce giant, Alibaba Group, has unveiled a book donation drive to help the underprivileged students. The company invited people to donate educational books like textbooks, study materials, and research materials. With this unique initiative, it aims to empower the underprivileged students. The program is named as ‘Mission Million Books’ by the organisers. The company volunteers will conduct book donation drive across the country till September 16. Its main motto is to ensure quality education to all students. It is learned that those materials, which will be collected during this program, will be distributed to over two-thousand educational institutions across the country. As per report, the company itself would donate nearly fifty thousand books to the program and would provide all the marketing and man power support to the initiative. After Brexit, however there is no uncertainty for one asset class and that is gold. Investment in gold has long been held as the best option for risk-averse investors in uncertain times. It was proved again as gold jumped nearly 5 percent on the day of the Brexit verdict. V.P. Nandakumar is MD & CEO of Manappuram Finance Ltd. and Chairman of CII, Kerala State Council. One of the most important tasks of professionals is to take decisions. Management is often called ‘decision making without bias!’. Some of these decisions are taken with deep analysis and some with the ‘gut feel’. we need to teach the young to temper their aspirations? Well, a good alternative is to provide them an avenue to experience some of it themselves. Internships are a great way of doing that. developed regions, I felt a strong urge to bringing contemporary infrastructure to our hometown. Why did you adopt the western style of infrastructure over the traditional style in your projects? The new generation is not interested in the traditional style of infrastructure. I know tens of thousands of people who share the same opinion. Once we achieve success, we will always try to improve the standard of living. Actually, the contemporary style is very good. It will give a class and stylish look to your living space. Traditionally, Thrissur is a cultural city. How did they respond to the western style concept? We got a huge positive response. We tried to merge contemporary western style with innovative ideas. That pattern of style is potential enough to gain positive response not only from Thrissur but also from the entire state. ‘Rahna homes’ prefers ecofriendly style. Why is that so? Customer satisfaction is one of the biggest awards that we clinched so far. We have over one hundred clients. We are still getting a friendly response from our customers. For a builder, it is the biggest achievement. ‘the Greens’, and ‘Heaven on Earth’. Of these five projects, the ‘Heaven on Earth ‘project situated in Palakkad gains greater importance, because it is a vacation home. What are the upcoming projects of Rahna homes? We are planning to develop a township. In our new project, we will appreciate client’s suggestions and incorporate their requirements effectively. What are the achievements earned by the company? Customer satisfaction is one of the biggest awards that we clinched so far. We have over one hundred clients. We are still getting a friendly response from our customers. For a builder, it is the biggest achievement. very easy, and it adds agony to the wounds of players whose frustration shows up on the faces after the performances after not making it, but you must appreciate the other nation's efforts and providing needed infrastructure to produce winners out of training sessions. At least to say, India needs a department of commonsense to provide a sports infrastructure. Speaking about Dipa Karmakar, who came fourth, Abhinav Bindra explains how it’s impressive that Karmakar came fourth or the Indian athletes even qualify for a gymnastic event. First, Dipa Karmakar’s physiotherapist was not able to travel with her. And was only rushed to Rio after she made the finals, contrary to what has been claimed publicly. India’s chief medical officer at the Olympics was a radiologist called Pawandeep Tony Singh. He knows nothing about sports medicine. When athletes went to him, his solution for all pains was Combiflam. ver Medalist’ at Rio Olympics 2016, was given a two acres of land by the government and look at what he created- 4 international medallists. Hence, each state can give free land for private sports academies. This will create wonders. All our stadiums are politically controlled. He got five acres of land from the state government after his ‘AllEngland’ win, but in order to turn his dream of building a world-class academy into a reality he even had to put his house on mortgage. His twin residential academies -both in Gachibowli area- have attracted talents from all over the country because these are professionallyrun institutions and Gopi takes personal interest in all trainees, not just the blue chip ones. The data shows, since 1991 till date the Indian markets (Sensex) has provided a CAGR of 16 percent. This clearly indicates that expecting extraordinary returns from the equity markets will make it a gamblerâ&#x20AC;&#x2122;s den. that of a business cycle or to that of our lives. We start off with a slow approach, accelerate peak and then finally diminish ourselves. Most importantly, we can witness this same set of phases getting repetitive, especially in stock market; and thus technical analysts believe in fractal way of understanding the markets. These cycles do repeat at shorter time frame, intermediate time frame as well as on the larger time frame thus making it a fractal. Thus all markets are cyclical. They go up, peak, go down and then bottom out. When one cycle is finished, the next begins. In summation, we can call these four phases as accumulation phase, growth phase, distribution phase and decline phase. Most investors and traders either fail to recognize these phases and get struck. When they fail to identify the phase of the cycle they are risking their hard earned money. sidering divorce as the only way out of misery get another last chance through this therapy. They articulate their aspirational qualities in their spouses. The marriage counselors and psychology experts have a list of few married couples who has these aspirational qualities. Then,the troubled couples are paired with strangers for two weeks. The strangers have these traits of aspirational qualities. They live together as if husband and wife. Yes, total strangers but having matched the corresponding aspirational behaviour and qualities are coupled for two weeks. This is switch therapy. Do these bizarre healing or behaviours qualify to be called therapies? You are licensed to a research on the authenticity of these behaviour modulations. Music therapy and other games and exposures are common. But water, sand, mud and shout are also used as therapies to bring confidence and other healing. You can predict the future trend of bizarre therapies. Can taking 'selfies' on your cell phone camera qualify as a therapy? May be to those introverted people who seek a window and door to express themselves, 'selfies' may be good therapy. Listing an SME on the platform has tax benefits, as Shareholders are eligible to claim complete exemption on long term capital gain and 15 % on Short term Capital Gains Tax. the way forward Introduction It is established that Small and Medium Enterprises play a vital role for the growth of the Indian economy. The sector contributes 45% of the country’s industrial output, 40% of the nation’s exports, 42 million in employment. In addition, the sector creates one million jobs every year and produces more than 8000 quality products for the Indian and international markets. As a result, Small and Medium Enterprises (“SMEs”) are today exposed to greater opportunities for expansion and diversification across the sectors. To promote, develop and enhance the vision and objectives of SMEs, the Indian Government has introduced various fiscal and regulatory policies for enhancing competitiveness of Indian SMEs in the global market. One of the key initiatives in this regard has been the introduction of Institutional Trading Platform (“ITP”) through SME platform. The SME platform is a Securities and Exchange Board of India (“SEBI) approved platform for SMEs to list their specified securities on the ITP of a recognised stock exchange without an Initial Public Offering. The main objective of this move is to widen the scope of fund raising methods meanwhile reducing the paperwork, increasing tax benefits and to provide easier exit options for informed investors like angel investors, VCFs, etc. Legal Framework of the ITP Regulatory framework for ITPs are provided in the Chapter XB of the SEBI (Issue of Capital and Disclosure Requirements) named SEBI (Listing of Specified Securities on Institutional Trading Platform) Regulations 2013. The framework prescribes the criteria for an SME to be complied for it to be listed on the SME platform and the Exit procedure so as to ensure the smooth flow of transactions and to minimise the disputes. Notably, a company with a net worth of at least INR 5 crores, with an otherwise clean track record, would be typically be qualified to list on the SME platform. Benefits of listing a SME on the ITP 1) Listing of specified securities without an IPO The benefit of this is twofold, one of the benefit is lesser regulatory compliance, as listing of securities on a stock exchange can be done without having complying with the Rule 19 of the Securities Contract (Regulation) Rules, 1957, as the said rule is notorious for its lengthy paperwork and procedure. The second benefit being the expense and time associated with issuing an IPO can be forgone. On an average, the expense associated with issuing an IPO is between 7 to 12 percent of the issue proceeds, which can be restricted to not exceeding 2-3 percent of the issue proceeds. Unique Time got an opportunity to interview Jomon Panangatt architect and interior designer of Rehna Homes. He is one of the busiest architects of Kerala. With his quintessential designs, he has earned good reputation and trust. More often, his designs have been showered with appreciation by his clients. We are getting huge positive repose from our customers. Our organisation is growing. We have been referred by our clients very often. “You bankers do all the KYC for ordinary salary class people like us, but then permit fraudsters to do all types of transactions using the banking channel. Bankers are penny wise and pound foolish”- His outburst continued for another 5 minutes. its managed service provider for the Central KYC Registry. Objectives and benefits The main objective is to reduce the burdenof producing KYC documents and getting those verified every time when the customer creates a new relationship with a financial entity.This initiative could result in avoiding the hassle of submission of same or multiple documents to different agencies for KYC compliance for entering into various financial transactions.It will help in expediting the KYC process and provide convenience to both, the financial institutions as well as the customers. As an end result, this would eventually helpin reducing turnaround time to onboard a new client. This process couldalso result in substantial cost reduction by avoiding multiplicity of registration and data upkeep, and ensure real-time notification to institutions on updation in KYC details As it is mandatory for all reporting entities to update the details of the new clients on-boarded and on account of the de-dupe process undertaken at Central KYC, the move could also aid the government in its fight against corruption and money laundering activities. Infact, theSpecial Investigation Team on black money appointed by Supreme Court had recommended the setup of a CKYC registry agency, which will help all financial institutions -like banks, fund houses, and insurance companies- perform KYC through a single window.Apart from facilitating the roll out, the digital India program, integration of Aadhaar linked E-KYC initiate of UIDAI with CKYC will also provide easy access to the common man to an array of financial services including banking, insurance, remittances, pension, mutual fund investment etc. In future, the scope can be widened even to various other areas like equity trading, travel and stay arrangements, land registrations etc. Standard data captured by all entities could also ease the reporting requirements under the Foreign Account Tax Compliance Act (FATCA) and Common Reporting Standards (CRS). Method Soak tamarind in 1/2 cup of warm water for a while, then squeeze and take the extract from it. Keep it aside. Heat oil in a pressure cooker and saute the sliced onions, garlic and green chillies. Add the vegetables and dal along with salt and turmeric powder and cover it and pressure cook up to 2 whistles.Remove the lid of the pressure cooker and add in the tamarind juice. Stir and simmer on low flame for some more time and add more salt if needed. Add chopped coriander leaves and sprinkle asafoetida powder, and simmer it for around 2 more minutes. Remove it from flame and keep it aside. Heat oil in a pan and allow mustard seeds to splutter.Add shallots, red chillies and curry leaves and fry for a minute. Mix in the sambar powder, coriander powder and chilli powder, and fry for at least 2 minutes on low flame. Now, pour the sambar to the wok and mix well for a few minutes. Method Add coconut, green chillies, cumin and turmeric along with water to form a fine paste, and keep it aside. Blend yogurt along with 1/2 cup water and salt until smooth. Keep it aside. Cook the plantain pieces in little water along with salt, 1/4 teaspoon turmeric powder and 1/2 teaspoon red chilli powder until soft.Add the coconut paste to the cooked plantain and mix it gently. Allow it to cook for 4-5 minutes.Reduce flame and add beaten curd. Heat it for a few minutes. Be careful not to boil the curry after adding curd.Heat oil in a pan and splutter mustard seeds. Saute shallots, dry red chillies and curry leaves for a few minutes.Add 1/4 teaspoon red chilli powder and 1/4 teaspoon fenugreek powder and sauteit for a minute.Pour the seasoning over the curry and mix it gently. Method Soak the Vanpayar for a long time in water. Collect the first extract of the coconut milk by squeezing the grated coconut with around half a litre of water. Collect the second extract also by pouring one litre of water once again into the grated coconut and squeezing it well. Add the green chillies,salt and the soaked ‘vanpayar’ to pumpkin.Cook it well and drain it. Add the 2nd extract of coconut milk to the cooked and drained vegetables. Allow it to boil.When it boils, switch off the flame and add the 1st extract of coconut milk. Heat oil in a pan, add the mustard seeds and curry leaves. When the seeds start crackling, turn off the flame and add it to the dish. Mix well. Method Wash the ‘Cherupayar’and pressure cook it with 2 cups of water for 3 whistles on medium-high heat. Boil the jaggery in 1 cup of water so that it melts completely.Filter to catch any residue and keep the jaggery syrup aside. Heat a large pan and transfer the cooked ‘cherupayaru’ to the pan.Pour in the jaggery syrup gently into it.Add a pinch of salt and cardamom powder. Let the mixture cook on medium-low heat for around 5 minutes. Keep on stirring the mixture as it thickens.Now, pour in the thin coconut milk and allow everything to come to a slow boil.Reduce heat and add thick coconut milk. Mix well and remove from heat after a minute or two. Heat 1 teaspoonof ghee in another pan and roast the grated coconut and Cashewnuts on medium heat until it becomes a deep brown colour. Add the roasted coconut to the payasam for added taste. occasionally. Heat oil in a non stick pan and fry the minced ginger for a few minutes until the raw smell disappears. Add the green chillies and continue frying till the ginger gets a golden brown colour.Reduce heat and add turmeric powder and red chilli powder. Saute for a minute and pour everything to the simmering jaggery and tamarind sauce. Sprinkle fenugreek powder. Stir the sauce and allow it to come to a boil.Meanwhile, heat 1 tablespoon oil in the same pan and splutter mustard seeds. Throw in the dried red chillies and curry leaves. Saute for a minute.Pour the seasoning over the sauce and mix well. Let the sauce simmer on medium-low heat until desired consistency is attained. when stirred, scoop these into a colander with a plate underneath to catch any oil drippings. Spread them on kitchen tissue to cool. Let them cool completely. In a thick bottomed pan, heat jaggery and water till jaggery melts. Strain this to removes any impurities. Now, reheat the strained syrup on a low to medium heat, stirring frequently till it reaches a thick consistency-i.e. the syrup will be like oil, whichmeans it be neither watery nor so thick. You can see thin threads of jaggery syrup when you stir it 2-3 thread consistency ’noolparuvam’. Reduce the heat to low and add the fried banana pieces and mix well and stir continuously.It will be really difficult to stir them. Now add the ginger powder, cardamom powder and cumin powder to this and stir constantly, so that all the slices are coated with the jaggery. Remove from the fire and let this cool for some time; then add powdered sugar and mix well. This gives a nice appearance to the ‘sharkaraupperi’ and the slices do not stick to one another. Add more sugar if required. ne of the three Baltic countries, Lithuania is located on the southeastern shore of the Baltic Sea. It is the neighbour of Latvia, Denmark, Belarus, Sweden, and Poland. Basically, this Baltic nation is the land of beautiful lakes, mesmerising castles, and astounding forests. As per survey details, the country has a population of around 2.9 million people –they are mostly ethnic Balkans. The country was previously occupied by the Soviet Union. In early 1990, the Lithuanians themselves declared independence from the USSR. Lithuania became the first Soviet State to declare independence itself. Now, it is a member of the European Union and NATO. It is the nineteenth member of the Eurozone and accepted Euro as their official currency. The country’s human development index is far above than the average, which indicates that the country is rapidly growing. Latvia and Lithuanian are common languages in the country. Vilnius, the capital city of Lithuania was built at least three centuries before. Quiet courtyards, peaceful churches, and vibrant streets are the main attraction of this city. Several prestigious national parks including Curonian Spit National Park are situated in the country. Because of their eco-friendly, geographical position, it became a friendly land for birds, reptiles and other animals. rich heritage of devil worship. You can find thousands of devil figurines, devil masks, and several ancient scripts in the museum. No visit to the country would be complete without tasting the native Lithuanian dish, ‘Cepelinai’. The dish is similar to the Swedish Kroppkaka. It is made using potato, meat, and curd. It is often served along with a sour cream. Apart from this, there are several other special dishes available in the country. The latest sixth generation is called the G12 and is a perfect blend of sleekness and luxury. The car appears longer and wider, giving it beautiful proportions like that of a sports saloon. Datsun, Nissan, VW, Porsche etc in their portfolio, but also they have a massive service facility to cater to the owners. So, buying a BMW no longer comes with the usual woes that you have experienced or heard your friends complaining. you. But, there was a big problem with buying one here. Strangely, it was never the car’s fault. of a sports saloon. The headlamps are a bit too long and there is a bit of a mismatch around the place where they meet the grilles, but the bonnet and fenders do take your eyes off this. The rear is ever more futuristic looking with elongated LED tail lamps and lashing of chrome everywhere. The version that was tested by us was the long wheelbase 730Ld M Sport, and it certainly appeals to the young, with its angry front bumpers, massive air dams, and 19-inch twin five spoke wheels. The M Sport kit costs approximately Rs.8 lakhs more than the standard car, but it combines sportiness and luxury like never before. The new 7 series comes loaded with so much technology. The headlines are the arrival of a carbon fibre reinforced polymer shell, like you get in supercars and laser headlamps . The carbon fibre shell helps this generation shave off as much as 130kgs off the old car. he historic film, directed by star director AshutoshGowariker, takes us to the Bronze Age Indus Valley society. In this movie, Hrithik Roshan acts as a poor farmer, who travels to a city and saves a young woman. Rahman’s music gives the film an extra mileage in the market. The director extensively used his advantages to describe the story accurately and justifiably. There are several mind-blowing action sequences in the movie. Apart from Hrithik, Pooja Hegde, KabirBedi, Arunoday Singh, and SuhasiniMulay appear in some of the key roles. It is completely a hero oriented tale, rather a historic tale. 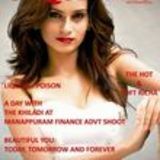 t is a crime thriller directed by Tinu Suresh Desai. The film is inspired by the sensational K M Nanavati vs State of Maharashtra case. In this movie, Akshay Kumar acts as a naval officer, Rustom, who goes on trial for the murder of his wife’s paramour. The story discusses public opinion, jury trial and human morals. The Nanavathi- Prem Ahuja story was one of the most-discussed news in Mumbai during 1959s. Several books had been published related to the case. The director has shown extreme consciousness in protecting the story’s soul. Apart from Akshay, Ileana D’Cruz, Esha Gupta, ArjanBajwa, and IndraneelBattachariya appear in prominent roles. t is an epic action drama directed by TimurBekmambetov. The movie is the fifth film adaptation of the renowned novel ‘Ben-Hur: a Tale of the Christ’ written by Lew Wallace on 1880s. It was once the best-selling American novel. The film is said to be the new interpretation of the old novel. Jack Huston, Morgan Freeman, Rodrigo Santoro, Toby Kebbell and NazaninBoniadi feature lead roles in the historic drama. It tells a painful story about vengeance, slavery, and betrayal. In the movie, the lead character was falsely accused of betrayal by his step-brother. The main character, effortlessly portrayed by Jack, endures years of slavery to avenge the betrayal. t is a fantasy drama directed by renowned filmmaker David Lowery. It tells us the story of a ten-year-old orphan and his friend, a giant dragon. Oakes Fegley, who acts as Pete, shows complete justice to his character. He deserves a standing ovation for his acting skills. Apart from Oakes, Bryce Dallas Howard, Robert Redford, Wes Bentley, and Oona Laurence appear in lead characters. The producers invested nearly 65 million USD in bringing out this visual treat. The story of the film is written by Senton I Miller. Toby Halbrooks’s screenplay is also worth appreciable. It is a perfect family entertainment. t is the story of Patty Hearst â&#x20AC;&#x201C;from the kidnapping to the sensational trial. In his research work, the author includes several research documents, interviews, confidential records and case details. Patty was the granddaughter of a media tycoon. She was kidnapped by the radical left-wing militants in early 70s. She had allegedly joined the group and involved in several crimes. Through her wild saga, the writer elucidates the altogether picture of a turbulent decade. He tries to state that the decade of 70s was one of the most disturbing decades of the American history. The book is the consolidation of his research and assumptions. he book is the story of New York City, precisely the role played by the city in the American Civil War. The writer points out the relevance of the city in the American political history. He opined that no American city raised more men, money, and material for the war. The writer claims that the city hosted several anti-war activists, rebellions, and pro-government activists. Through his book, it tries to eliminate some of the misconceptions related to the Civil War. We can see a ground level report rather than an elite confession in this book. The writer defends his argument with some concrete facts and findings. he book explains us about the relevance of family relationships. It is a heartbreaking story of a daughter, Nadja, who tries to investigate the love existing between the mothers and daughters. The writer successfully bought in the love that spans generations into the book. This non-fiction work is mostly a kind of writer’s memoir. At the same time, it is definitely a work of art. The theme of the story, itself, is an individual can be an author of their own life. The writer’s mother is the central character of the story- a connection link between generations-, but she is not the narrator. The author’s writing skill and creative skill is evident in most of the sections. he writer takes us to the fascinating world of Hindu mythology. He answers several disturbing questions, which often arrives when we come across some Hindu mythological stories. The book is based on the first series of the popular TV show telecasted in the same title. In the short period of time, the television series have attracted a large number of audiences. This work gives its readers a convincing answer to several controversial questions, like how are an ‘asura’, ‘rakshasa’ and ‘pishacha’ different from each other, and why are most temples across the country dedicated to ‘Lord Vishnu’ and ‘Lord Siva’, but not to ‘Lord Brahma’. It is definitely a modernised interpretation of the Hindu mythology.